I’m one of the Botany Curators at Te Papa, and ferns are one of my specialties. New Zealand has about 200 native ferns, and some of them are very rare. We recently rediscovered one rare fern that had been ‘lost’. I was beginning to wonder if it had become extinct, but fortunately it has not. Still, the known total of individuals is still only 9, and this population is only a goat-lunch away from extinction! The rediscovered fern is a maidenhair spleenwort. It had been definitively identified from just three New Zealand sites, all in Hawke’s Bay, and all dating to the 1950’s. The localities of these three sites were not precisely recorded, and no one I talked to knew of a living population. 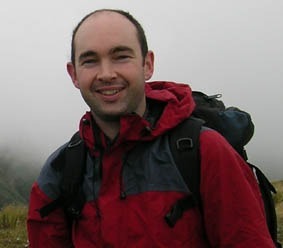 I enlisted the help of the Manawatu Botanical Society to search one of these sites (the most precise one, which involved searching several square km rather than several tens of square km). I wasn’t very optimistic, given the amount of time since it had been previously collected and that I had already looked at a number of similar Hawke’s Bay sites. But, we found it – 9 plants in one very small area. There is another maidenhair spleenwort in NZ, and it is quite common. These two maidenhair spleenworts look similar, but they have different chromosome numbers; the common one has six sets of chromosomes while the rare one has four sets. This kind of difference is usually treated at the subspecies or even species level in ferns. Unfortunately, the present taxonomy, or formal scientific naming, for these ferns is not adequate. We hope to sort this out in the next year or so. They have both been called Asplenium trichomanes, but this fern does not occur in NZ (at least when interpreted in a narrow sense). The rare maidenhair spleenwort in NZ has also been called Asplenium trichomanes subsp. quadrivalens; whether this is correct remains to be established. Maidenhair spleenwort. This is the rare species, but the common one looks very similar. 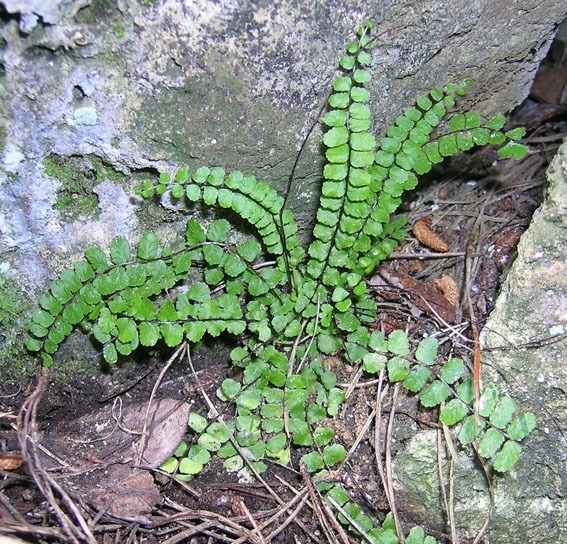 The two maidenhair spleenworts usually occur on or near limestone. They can be distinguished from all other ferns in NZ by their undivided, black, almost smooth stems, and by having their reproductive structures in lines away from the margins of the undersides of their leaves. This particular arrangement of the reproductive structures characteristics all of the spleenwort (Asplenium) species, of which there are about 20 in NZ (and some 600 in the world). I’d be interested in learning of additional maidenhair spleenwort sites in Hawke’s Bay. Both species of maidenhair spleenwort have been recorded from the Hawke’s Bay, so any new finds may be the rare or the common species. I would need to closely inspect them to be sure. But, please, do not remove them from the wild! Email (leonp@tepapa.govt.nz) or phone (04 381 7261) me the locality details. Te Papa’s Collections Online includes a photo of a maidenhair spleenwort specimen collected from the Hawke’s Bay in 1881 (it’s the common species, rather than the rare one). The New Zealand Plant Conservation Network also has more information about maidenhair spleenworts.